When you create a CHM file or open an existing one, you may face the following issue: the HTML Help viewer correctly displays the Table of Contents, but instead of the content on the right pane you will see a message such as “Navigation to the webpage was canceled” or “This program cannot display the webpage”. 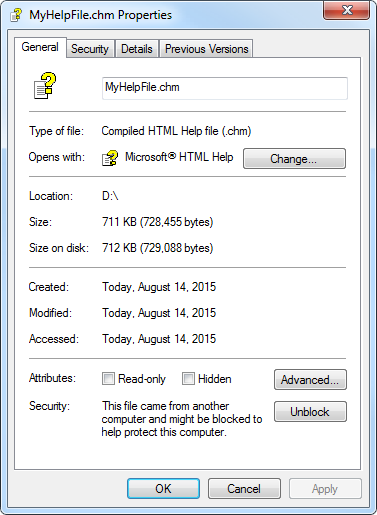 In Windows Explorer, right-click on your CHM file. In the Properties dialog, click Unblock. Please note that in most cases the mentioned issue happens when you try to access a CHM file from a remote PC and usually that does not occur when your CHM help file is distributed with an application and accessed from the local machine. For more details and possible solutions, you can view our article dedicated to this problem. If you need your users to access your help system through network, we recommend using the Web Help output format instead of HTML Help. Since Web Help is a browser-based help system, it can be easily placed on a web server, or even in a shared folder of your corporate local area network. It should be pointed out that HelpSmith allows you to create a Web Help system whose features are very similar to a CHM file including TOC, Index and Search capabilities, and also it includes the possibility to integrate your help system with your application or website.